Walker HK, Hall WD, Hurst JW, editors. Clinical Methods: The History, Physical, and Laboratory Examinations. 3rd edition. Boston: Butterworths; 1990. Walker HK, Hall WD, Hurst JW, editors. Born in 1785 in Lebanon, Connecticut, William Beaumont was the son of a thriving farmer and veteran of the Revolutionary War. After declining an offer by his father of a nearby farm, Beaumont left home in 1806 at age 22 with a horse and sleigh, a barrel of cider, and $100. He settled in Champlain, New York, near the Canadian border, and taught school for 3 years. In 1810, at age 25, Beaumont entered a preceptorship under Benjamin Chandler in St. Albans, Vermont, living in Chandler's home for 2 years as an apprentice. He learned medicine primarily through observation of patients rather than through study of books, and recorded cases and his thoughts in notebooks, a habit he continued throughout his life. At the outbreak of the War of 1812, Beaumont left Chandler with a medical license from Vermont and crossed Lake Champlain to Plattsburgh, New York, where he entered the army as a surgeon's mate. Over the next 3 years he gained experience treating soldiers and performed numerous autopsies. He participated in the capture of York in 1813 and the Battle of Plattsburgh in 1814, and resigned when the Treaty of Ghent ended the war in 1815. Under Beaumont's care, St. Martin survived the immediate effects of the wound but acquired a gastrocutaneous fistula, where the wounded stomach adhered to intercostal muscles. St. Martin remained debilitated and destitute after 10 months, so Beaumont took him into his own home and sustained him. He began those experiments in May 1825 at Fort Mackinac and completed the last in 1833 at Plattsburgh. In 1833, at age 48, Beaumont published his Experiments and Observations on the Gastric Juice and the Physiology of Digestion, a 280-page book divided into two sections. The first contains general observations on various topics in gastroenterology. The second contains a description of the 238 experiments, concluding with 51 inferences. Osler (1902) considered the following to be the important contributions of Beaumont: (1) a more accurate and complete description of gastric juice; (2) confirmation of the previous observation that hydrochloric acid was the important acid of gastric juice; (3) recognition that gastric juice and mucus were separate secretions; (4) establishment of the influence of mental disturbance on secretion of gastric juice and digestion; (5) a more accurate and fuller comparison of the action of gastric juice inside and outside the stomach; (6) refutation of many erroneous opinions; (7) the first comprehensive study of motions of the stomach; and (8) a table of the digestibility of different articles of diet. St. Martin left Beaumont forever in 1834. A year later, at age 50, Beaumont was ordered to St. Louis, where he lived the rest of his life and engaged in a lucrative private practice. When Captain Robert E. Lee and his family were stationed at St. Louis, they dined often at the Beaumont home. When he was ordered to Florida after 4 years in St. Louis, Beaumont submitted a conditional resignation, which was accepted in 1840, ending 25 years of military service. He died in 1853 at age 68 but will be remembered for an extraordinary 9-year period of his life, from 1825 to 1833, during which his 238 experiments on St. Martin were conducted. As Osler said, "The man and the opportunity had met." Myers JS. Life and letters of Dr. William Beaumont. St. Louis: C. V. Mosby, 1912. Osler W. William Beaumont. A pioneer American physiologist. JAMA. 1902;39:1223–31. Copyright © 1990, Butterworth Publishers, a division of Reed Publishing. Roberts CS. William Beaumont, the Man and the Opportunity. In: Walker HK, Hall WD, Hurst JW, editors. Clinical Methods: The History, Physical, and Laboratory Examinations. 3rd edition. Boston: Butterworths; 1990. William Beaumont: the man, his time, and his legacy. Wolf S. Fed Proc. 1985 Nov; 44(14):2887-8. Working ethics: William Beaumont, Alexis St. Martin, and medical research in antebellum America. Green A. Bull Hist Med. 2010 Summer; 84(2):193-216. 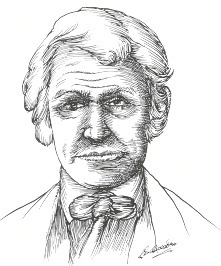 Dr. William Beaumont, a Sketch. Steiner WR. Yale J Biol Med. 1933 Oct; 6(1):1-8.
Review Medical ethics for the genome world: a paper from the 2007 William Beaumont hospital symposium on molecular pathology. Ormond KE. J Mol Diagn. 2008 Sep; 10(5):377-82. Epub 2008 Aug 7.
Review The -omics era and its impact. Kiechle FL, Zhang X, Holland-Staley CA. Arch Pathol Lab Med. 2004 Dec; 128(12):1337-45.